Revered by many anthropologists as the 'cradle of humanity', Kenya is wild and a little dangerous. If you're adventurous - and sensible - it promises the globe's most magnificent wildlife parks, unsullied beaches, thriving coral reefs, memorable mountainscapes and ancient Swahili cities. The Swahili word safari (literally, journey) wouldn't mean much to most people if it wasn't for this East African adventure land. No matter how many Tarzan movies you've seen, nothing will prepare you for the annual mass migration of wildebeests in the Masai Mara. Kenya 2016 so far arriving in Kenya. Dubai Skipped! Good for camping, hippo watching, clubbing, boat riding, horse riding. Comfortable for couples, family members, friends or just alone. 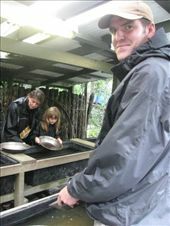 Pete panning for gold at Shantytown.